Larsen toiling away in the Mines of Mole-ia. Hey y’all, I’m writing today about burrows – but I’m talking packrats not pack animals. 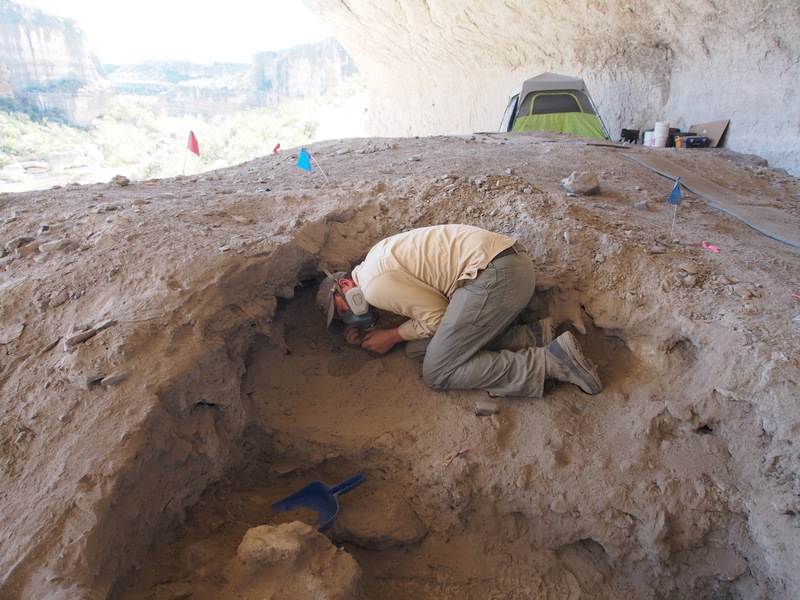 If you don’t remember me, my name is Larsen, and I am a recent graduate of Texas State, and this is the first long-term archaeological project I have worked on. One of the things that surprised me when I first started excavating out here is the large number of burrows we encounter. The burrows range from small and winding to large and cavernous. In some places it feels more like we are exploring some vast ancient underground city created by small creatures. Was it miniature Yeti, a.k.a. Littlefoot? Nope, it’s burrowing rodents. The focus of our Eagle Cave excavations this season is the south face of the trench originally created by the Witte Museum in the 1930s and widened by the University of Texas at Austin crew in the 1960s. 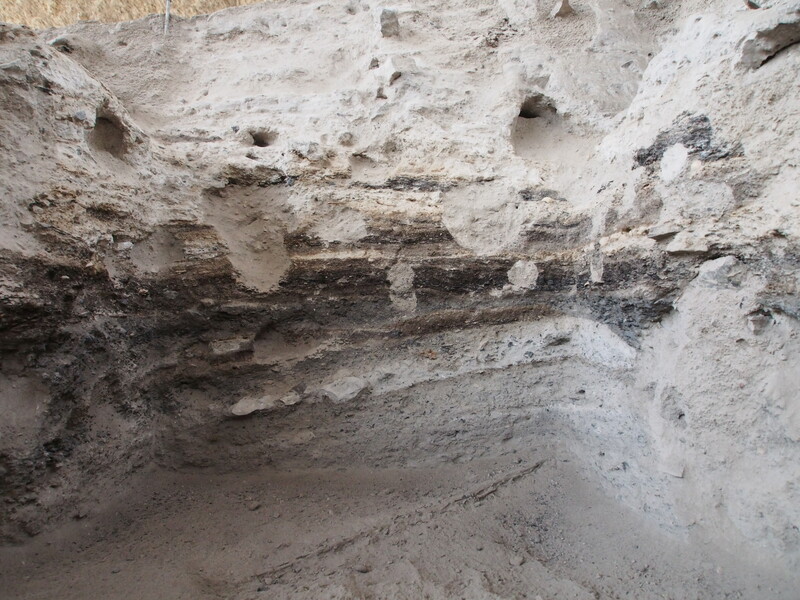 When we began excavating we were attempting to cut through the surface disturbed material to intact deposits. As Emily and I excavated our first unit, we had to discontinue cutting south into the trench face because we ran into an extremely large burrow, which we started calling the “Badger Burrow”. Charles attempting to curl up in the “Badger Burrow”. In this same area, I was excavating back the face of the unit and came upon a burrow with a tail sticking out of it! I was somewhat startled by this as we had been joking about cutting into a badger burrow and having an angry badger jump into someone’s face. At first I thought it was a snake, but then I realized it was a hibernating lizard. I gently removed the lizard and moved it to a place where it would be safe from animals and archaeologists. These burrows are good examples of today’s blog topic: bioturbation. Bioturbation is the term archaeologists use for any disturbance of the ground by living things. These include plants and tree roots, rodents, reptiles, insects, worms and any other organism that delves into the ground. Bioturbation is an issue all archaeologists face in some form or another. So, how does bioturbation affect archeological digs? Bill Murray isn’t the only one concerned with burrowing animals. Archaeologists are concerned with bioturbation because it alters the archaeological context (see Where Context is Crucial). As organisms move through the earth they can affect the archaeological record in several ways. First, and most obviously, bioturbation changes the stratigraphy. Roots and especially burrows move dirt around in the earth. Dirt that was down deep is brought up, dirt that was near the surface is carried down and earth can be moved all over as animals backfill their own burrows. 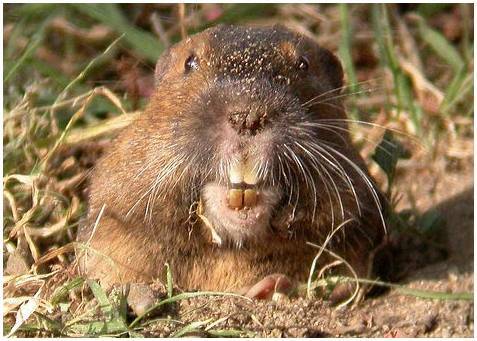 In a Canadian study of pocket gophers it was estimated that, if one gopher at a time lived in a 10x20m area and digging activity remained constant over 200 years, approximately 25 metric tons of earth would be moved! Hello, Mr. Pocket Gopher, it’s your friend Mr. Squirrel. Burrowing animals often move artifacts up in the ground. The gophers, for example, make burrows about 6-7cm wide. Anything they come across that is less than 6-7cm, such as tools or projectile points, will be carried by the gopher out to the surface or into a side chamber of the burrow. Bioturbation can also cause artifacts to move down farther into the ground. 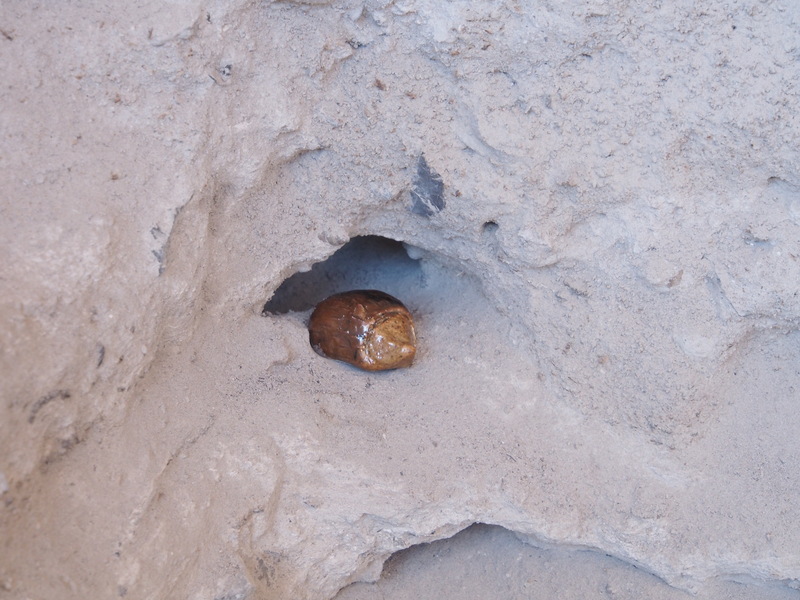 Burrowing by animals can undermine artifacts, even artifacts much larger than the animal (like a grinding slab for example), which allows them to sink down in the earth. Burrowing animals also have a tendency to bring things in to their burrow, such as food or nesting materials. This means that some objects may seem to be deposited by people, but in actuality were brought into the ground by animals. The movement of earth and artifacts through bioturbation requires archaeologists to understand that just because an artifact is found in a certain stratum does not mean it was originally deposited at the same time as that stratum. It also means care should be taken in establishing an age for a stratum or an artifact. The destruction of a stratum or the movement of artifacts are negative aspects of bioturbation, from an archaeological standpoint. Bioturbation can also, however, be a positive thing. Bioturbation can be a tool an archaeologist uses to study the past. The organic things brought into a burrow can tell us a lot about the past. 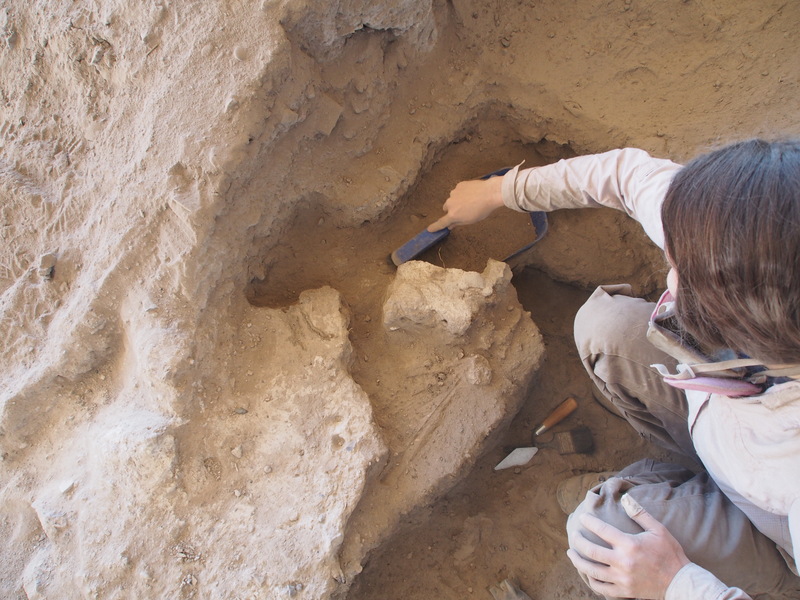 The plant and animal remains preserved in a burrow inform us about what kinds of plants and animals lived in the area at a certain point in time. Because plants and animals like certain kinds of conditions, such as temperature and precipitation, we can extrapolate what the climate was like in the area at that time as well. I recently learned of another positive aspect of bioturbation while listening to the radio. There was a story about two archaeologists, one in England and one in Denmark, who were using moles to gather archaeological data. 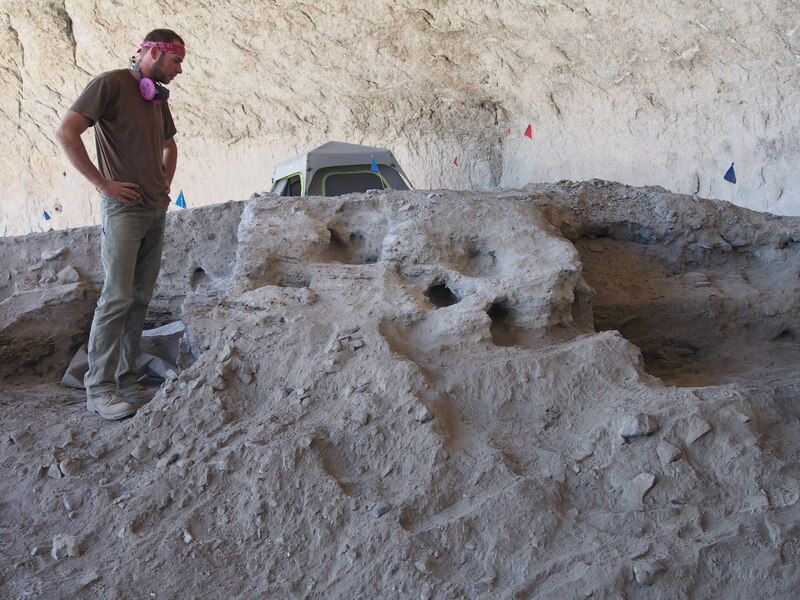 Both were analyzing things brought to the surface by moles at protected sites where the archaeologists were not permitted to conduct an excavation themselves. 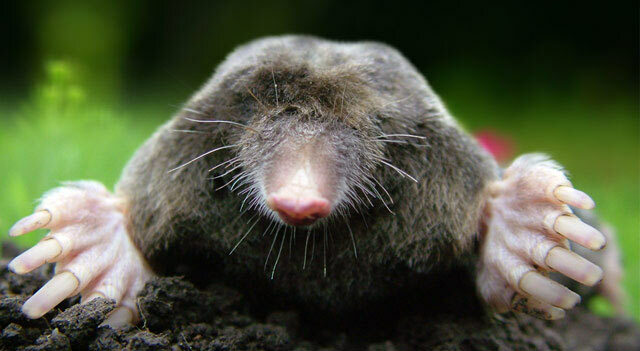 A mole (happily, not present in Eagle Cave!). In Viborg, Denmark, Jesper Hjermind studies what moles dig up at the site of a medieval fort. The moles often bring up artifacts and pieces of brick. By analyzing these objects, Hjermind is able to determine the location of buildings at the fort. If there are many objects at a molehill, then that is where a building is underground. The story can be found at: http://cphpost.dk/news/moles-digging-in-the-name-of-archaeology.12859.html . At the site of a Roman barracks known as Epiacum in Cumbria, England, Paul Frodsham is also not allowed to excavate because the site is protected. He sifts through the tailings at molehills to find artifacts from Roman times. While this does not give him a full picture of the archaeology at the site, it allows him at least a glimpse. The story can be found here: http://www.bbc.com/news/uk-england-cumbria-22363936 . What all this tells us is that bioturbation is a fact of life for an archaeologist and it can be either a help or a hindrance depending on how it is approached. Common bioturbators of the Lower Pecos region. So what does bioturbation mean for us on site in Eagle Cave? How do we recognize it? How does it hinder us and how does it help us? At the surface in Eagle Cave, the main agents of bioturbation were sheep, goats, and people. Eagle Cave was used in the early 20th century as a convenient place to pen sheep awaiting shearing in the pens atop the cliff. This means that the surface was mixed up by their milling about and is heavily disturbed. Further, people visiting the site for nearly a century have picked, plucked, and scratched at the surface (and deeper) of Eagle. We surmise the strata from the Historic through the Late Prehistoric eras – the layers at the “top” of the shelter profile – are nearly completely destroyed. When we excavate at Eagle Cave, we first clear away the disturbed surface layer to get to the intact deposits underneath. As we dig into these intact strata, the main agents of bioturbation are burrowing animals such as rodents, lizards, and insects. The burrows we find range from very small insect burrows to extremely large mammal burrows. Most burrows are from rodents and are, on average, about 7cm (~2-3 inches) in diameter. We are able to distinguish burrows from intact material in several ways. PS010 is a nice example of different burrow sizes and shapes. Note the excellent color contrast in the central burrows. First, we use visual clues to identify burrows. We often have clear layers (e.g., alternating white, black, and gray bands of ash, charred fibers and the like), and whenever there is an interruption in the strat from a burrow, the contrasting colors stand out, like in the above photo. We also often see nesting material in the burrow matrix, grass or straw, and sometimes there are pockets of cached seeds. In modern burrows, we often find sheep and goat dung mixed in as well. Plan view of Emily excavating a burrow. In plan view (looking down on a unit from above) we can often see the burrow as a linear track extending across the unit. In profile view (looking at a vertical surface from the side) we often see burrows as either a circle of material, a hole, or as a linear disturbance extending across a profile face. Archaeological excavation is not just dependent on visual cues, like color changes, but is also an extremely tactile endeavor. When we hit a burrow, it usually feels very different under the trowel from the rest of the stratum. Most of the time the burrow material is exceptionally loose; the trowel just sinks right in several centimeters without any pressure applied by the excavator at all. Bryan excavates a rodent metropolis. The deposits at Eagle Cave often have burrows in them, and it can be extremely frustrating for an archaeologist to work with strata that are more burrow than intact. When we began excavation this season, we were excavating near the back of the shelter and we had to move a lot of earth before we found intact deposits. As we were cutting back the trench face we finally had to stop because we came upon a burrow nearly a meter across, the aforementioned “Badger Burrow”. We are no longer excavating from this area (the far right unit in the photo to the right) to the back of the shelter because it is all the backfilled trenches of the excavations in the 1930s; which just goes to show that archaeologists can be proficient bioturbators as well! While at times frustrating, the disturbed and burrow material does not go to waste. We screen samples of these disturbed sediments on-site and use the artifacts we find for educational purposes here and at Texas State University. We often find interesting artifacts within the burrow material, including two large bison teeth this season. Bodilly, the Bioturbation Hedgehog, promotes awareness of bioturbation amongst archaeologists. So, while these artifacts have no clear archaeological context, they do clue us in as to the types of artifacts we should find. And we retain rare items (like a mussel shell pendant we found this week). They are also exciting finds that keep us motivated and in good spirits! In summary, bioturbation is a part of nearly every archaeological excavation. It is important for researchers to understand the role bioturbation plays in the formation of an archaeological site so we can accurately interpret the data from a site. Although bioturbation is often frustrating, it can also be helpful to an archaeologist if used as another means of gathering information. 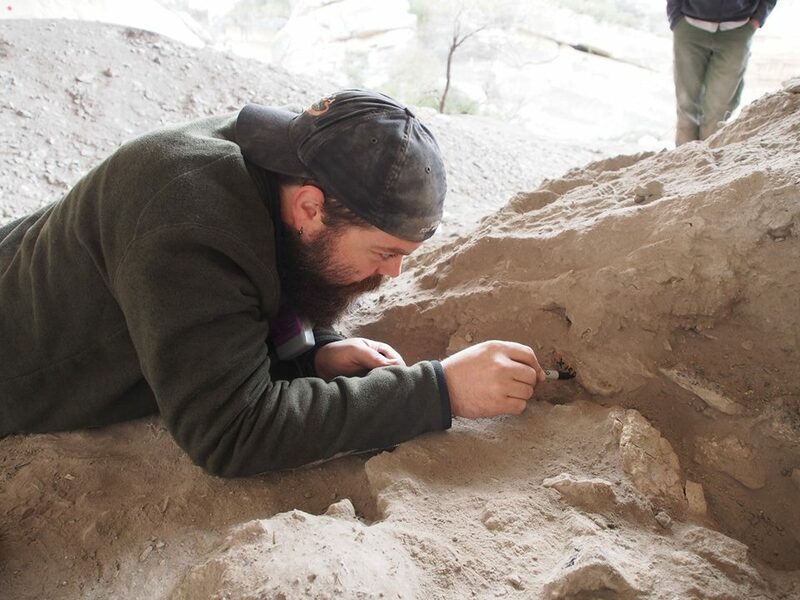 We try to keep this in mind here at ASWT when we come upon an area that is more burrow than strat and makes us feel more like rodentologists than archaeologists. Although the Burrowing Snouters have a thoroughly primitive-looking nasarium, that doubtless has been derived from that of the ancestral Snouters, nevertheless they are remarkable in that in extreme cases the snout predominates heavily over the rest of the entire body. In this respect quite apart from the concomitant reduction of their whole structural organization they are unique, not only among Snouters but among all vertebrates. Thanks for the link. I only skimmed it but it looks interesting. We keep our noses to the grindstone out here, but we will see if we can sniff out some Snouters. We generally have a good nose for faunal remains. The study of cryptobioturbational agents is a fascinating subfield of phantasmozooarchaeology. I think the largest and most destructive bioturbators at your site are those pictured at the upper right side of your photo “common bioturbators of the lower Pecos Region”. On the bright side, most of your stratigraphy is NOT an artifact of bioturbation…just a fraction of it. Think East Texas if you want the flip side of this coin….